One of Nintendo’s newest 3Ds games is Donkey Kong Country Returns 3D. I remember when the first Donkey Kong Country came out for Super Nintendo. I was in college and my brother was in high school. We’d play it on weekends and have a ton of fun. I got really good at it, too! It was a great bonding experience for us, so when I learned of this newest incarnation, I knew I wanted to give it a try. Planning a big birthday party around Donkey Kong Country was icing for his cake. 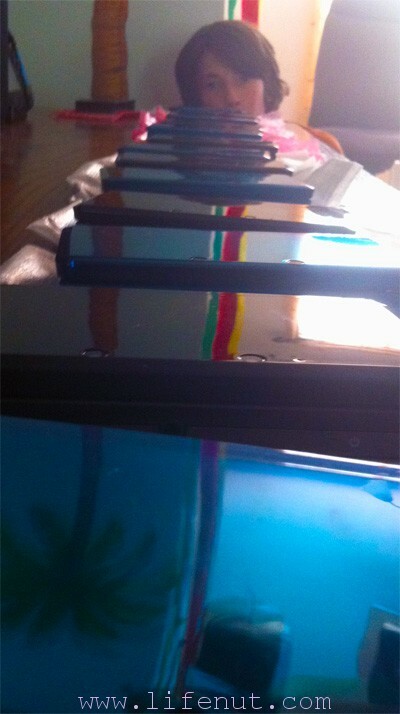 Nintendo sent FIFTEEN loaner 3DSs so that all the partiers could get in on the action and play together. At Sam’s request, Lee took all the younger siblings away so that our house could be taken over by teenagers for an afternoon. We had a great time decorating our house—inside and outside—in a Tiki Jungle Primate theme replete with five large pizzas, tons of soda, and candy candy candy. I was so fond of the decorations, we may have left them up for several days, baffling the neighbors. We are good at that. The guests dove right in to game play the moment they arrived, pairing up and then switching with friends. 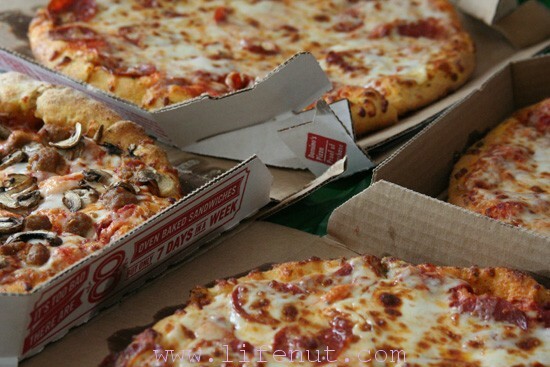 Only the siren call of pepperoni dragged them away from smashing barrels and saving bananas. Sam had a great time playing host, showing off other Nintendo goodies like the WiiU and Nintendoland. I thought someone might call the cops because eleven screaming teenagers attracts attention. Mostly, I stayed in another room because I have no Cool Mom aspirations and believe the less I interject in their fun, the more fun they’d have. That’s a great thing about Nintendo, too. Kids who weren’t totally familiar with Nintendo were up to speed in no time because the playing systems are so user-friendly. 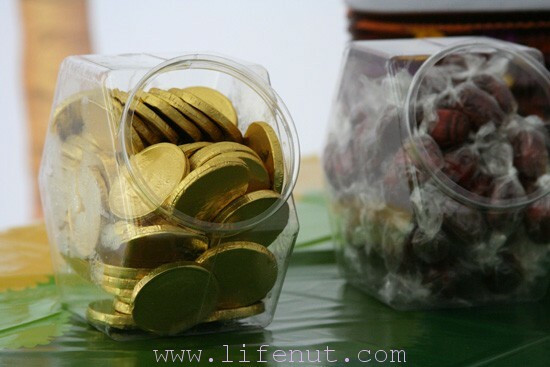 Chocolate coins and root beer barrels---fun party food ideas! The party lasted an hour longer than planned, but I didn’t notice right off the bat. Sam’s guests left with cool party favors thanks to Nintendo, including new hats and candy. 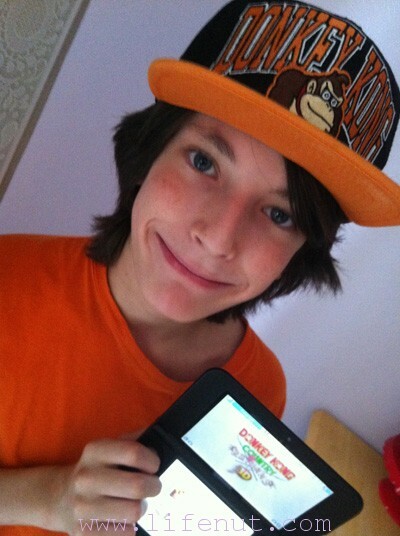 One of his friends left with a brand-new Nintendo 3DS XL and a copy of Donkey Kong Country Returns 3D. We did a random drawing out of a hat and it’s the best thing we’ve ever given away. Usually, we give away cold viruses and stuff. Not that day! Sam’s friend was shocked and loves it, his mom reports. Our birthday boy also received his own 3DS XL and game. The 3D effects look amazing on the big screen. It’s been fun watching him shoot videos, play games, and he used it to keep track of out of state license plates on our drive home from Grand Junction. Big screen! Big gorilla! Big smile! Sam’s birthday party was one of the highlights of his summer. It was one of the highlights of my summer, too. It came together beautifully and it was so much fun. I heartily recommend the game and Nintendo’s variety of playing systems for all group gatherings. Game playing brings people together! Disclosure: We are Nintendo Ambassadors. Nintendo of America provided loaner 3DSs and games for party guests to use. They also provided party decorations, food, and favors as well as prizes. The party experience was solely ours and the opinions generated by all aspects of the party are solely ours. They set us up and we ran with it and had a fabulous time. What a cool thing, to be Nintendo Ambassadors… how do you become one? Happy belated birthday to Sam!!!! It is a lot of fun, Jill. We became ambassadors when they were searching for people in the Denver area. We hosted a party, then they invited us to join in on the fun. I think being genuine, life-long fans of all-things Nintendo helped. I’ve been playing since my brother got his first NES back in the 80s. OHMYOSH, talk about a birthday he will never forget! We bought Bode two new favorites for his 3DS: Luigi’s Mansion Dark Moon and Lego City Undercover: The Chase Begins. Highly recommend! I’d love to have the Lego City game for *MY* 3DS! We have Lego City Undercover for the WiiU and it’s a riot. It’s probably everyone’s favorite WiiU game right now. Such an awesome party idea and perfect the gaming boys! I love seeing the gaming names we grew up with reinvented and brought into my kid’s view as COOL. We’ve had a couple gaming parties.. pulled all the TVs in the house into one room – hours of boy battling fun! 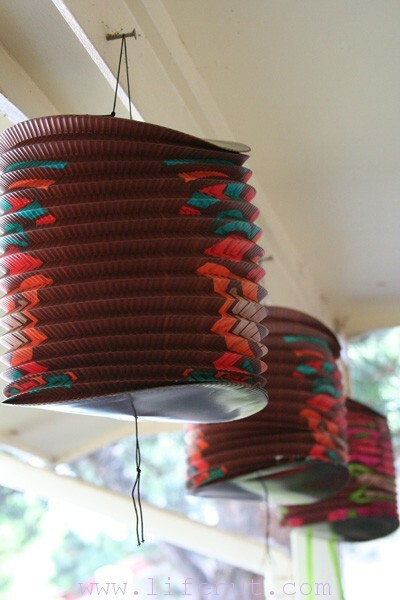 Thanks so much for sharing this cool idea!